No Google Maps is not the answer!!! 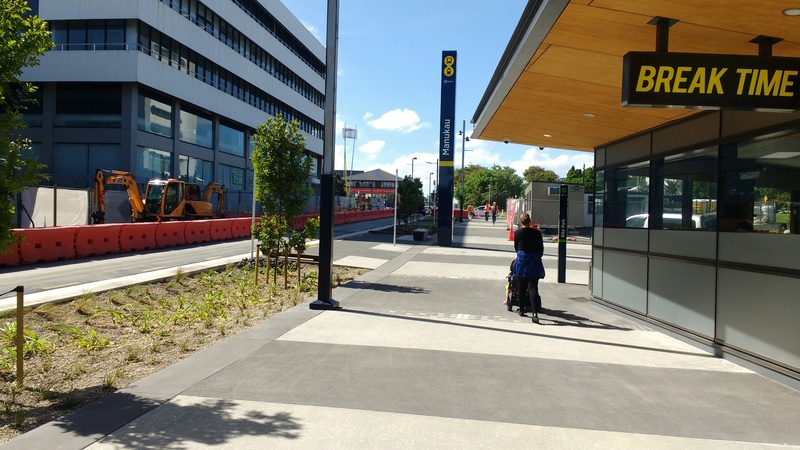 Wayfinding (that is public information being readily available to help you find your way) and public loos – something Auckland really lacks in and consequently does not help the transit experience one little bit no matter how seasoned you are in travelling. 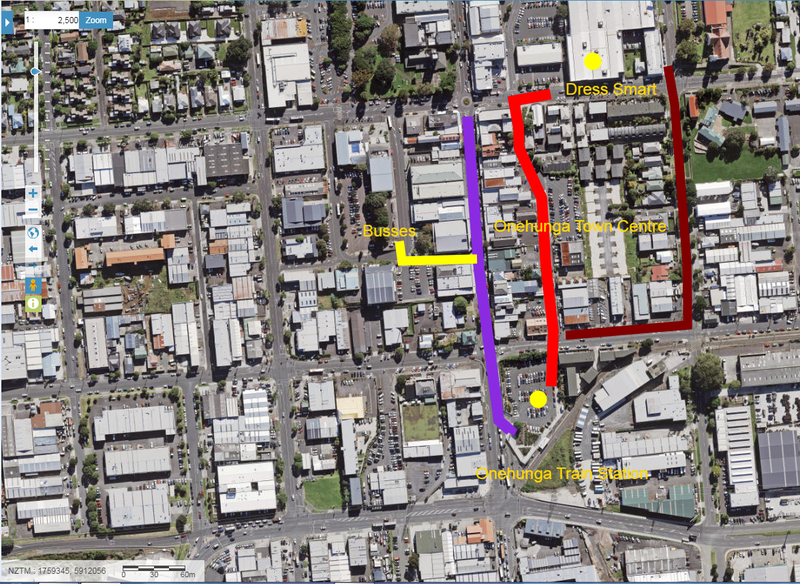 In two recent Urban Geography field exercises (one in Transform Onehunga, the other as a meeting with a Place Making leader for Transform Manukau) a certain topic was brought up very quickly in post exercise discussions. No it was not Auckland Transport’s level of service when it came to transit provisions (not this time any way) but rather where to go once you have left a train or bus to get to your destination efficiently and smartly. That is how is the level of Way-finding to sign post that last mile trip to your first destination (and first mile on the return trip)? 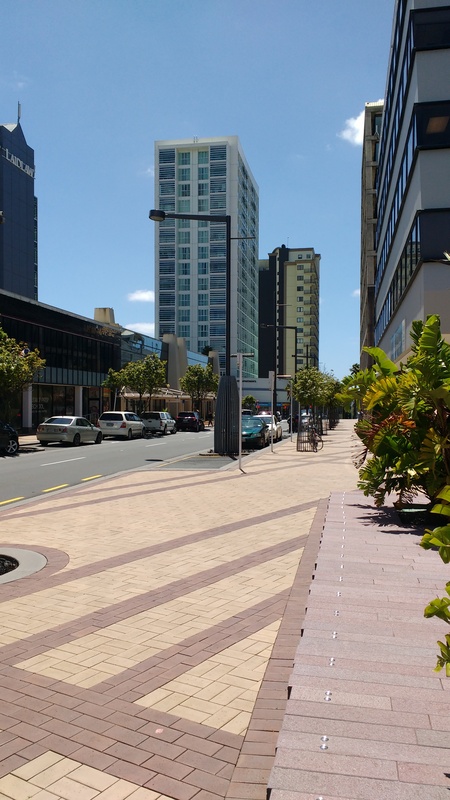 Well for both Transform Onehunga and Transform Manukau it was pretty dismal and by the looks of it an afterthought from Auckland Transport. A visiting family (all had HOP cards) got off the train and wanted to go to Dress Smart. Problem? Did not know how to given there are three different ways in getting there as the upcoming pictures will show. The first thing they look for? Way-finding signs. They found them only for them to point to the Town Centre and some bus stops, no Dress Smart and no map (that is not found until you get to the bus stops on Onehunga Mall). To make the user experience even worse the main way-finding sign is on the left side of the station (the visitors were at the right hand side of the station where they disembarked from the train) and up a four metre high pole with often the sun striking you right in the eyes. In the end I pointed out where Dress Smart was and they were very happy to be on their way. However, their user experience has already been soured and it should not take another person to do the job Auckland Transport should be doing with some decent way-finding signage (given people who might know are not always around). Finally just to make the user experience even more off-putting for these visitors trying to cross Princess Street that has no pedestrian crossings as well as trying staying on course (no secondary way-finding for those en-route to their destination). 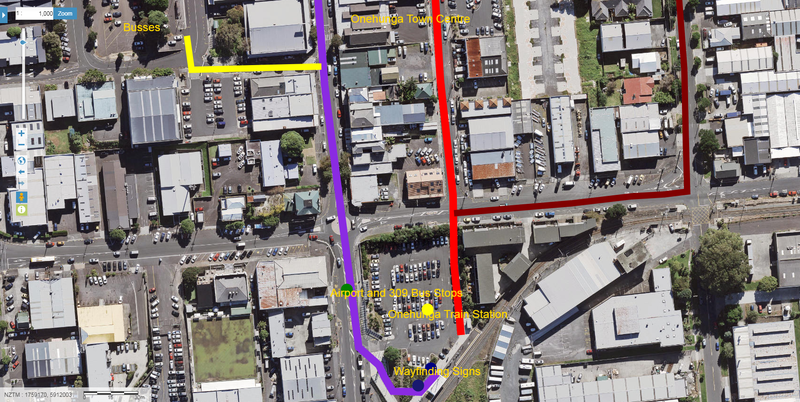 Onehunga Station with exit points and pedestrian routes to either the Town Centre or Dress Smart. Three different routes (plus the detour to the main bus interchange) to Dress Smart none of which have any way-finding (the Town Centre and the bus stops/interchange have poor way-finding as well) – meaning lost visitors and poor user experience. Way-finding does not need to be overly expensive but it does need to be regular (that is at frequent intervals but not causing street clutter) and suited to the urban geographic environment it will be located in. 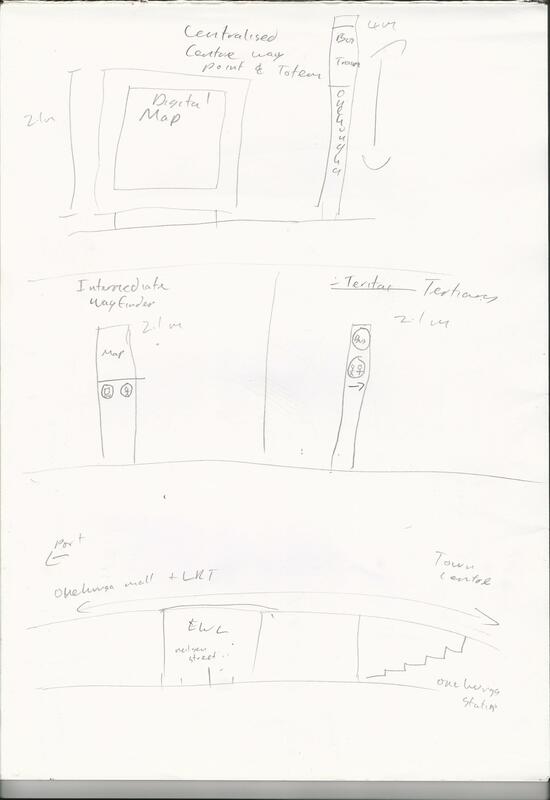 That is it is inappropriate for five metre high way-finding totems to be placed everywhere while smaller 2.1m high way-finding totems are not going to quite cut it if you need an anchor landmark for people to lock onto to get to a station. Again 2.1m high totem poles stripped right back to provide a couple of key destination indicators such as toilets, the station or an anchor point. This class of Wayfinder is used for “en-route” travel routes, that is placed every 50-75m between two Intermediate Class or a Primary Class Wayfinder to keep people on course to their destination and back. This is particularly useful if the user can not see their end point from their line of sight. Briefly – we need more public loos and more paid showers in our public spaces. Nothing worse having to hold on trying to find a loo that might be some 100 metres or more away especially when it involves kids. Showers you say? Station especially larger stations should have paid showers especially as biking becomes more prevalent in Auckland. You can for an extra one dollar have shampoo and conditioner dispensed and for $5 a towel that you get to take home. Loos and showers give people some basic dignity including our homeless population. So what are we waiting for Auckland Transport and Panuku? Let’s improve our user experience through better way-finding and also give some basic dignity through better provisions of public loos and public showers! Wayfinding in Auckland is terrible, as a general rule. Having travelled in various world cities, it seems to me that the people who consider this aspect of the public transport system need to think about travel from the pov of the enduser (as in your example about the family going to Dressmart). The entire Auckland system seems to be based on the premise that you already know where you’re going, and how the system works, having lived here all your life. Small, random example: I live in Beach Haven, and have seen various signs pointing to “ferry”. Great… but it doesn’t tell me how far away the ferry is. It should say “ferry 200m” or “ferry 3.2km” as some of the signs are crazily far from the actual wharf, implying that those responsible envisaged that everyone would be driving to the ferry. In London (I *know* Auckland is not as big, nor as rich, but we can still learn from their positive and negative points), every station has a diagram of the surrounding streets and notable features (including bus stops, etc). This makes it easy to arrive at an unfamiliar station and easily find my way to connecting buses. Not hard. Just takes time and thought.